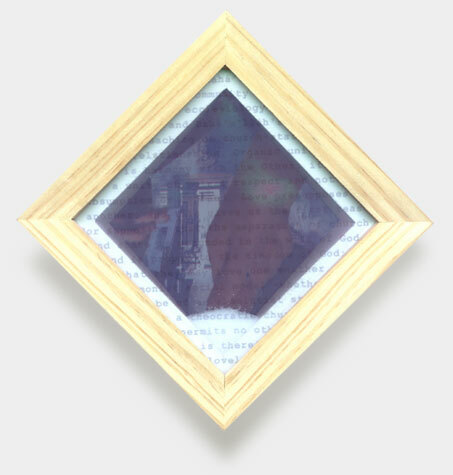 Computer print on plastic, salt, frame. 20 x 20 x 5 cm. 2006 Cafe Gallery Open Southwark Park, London, U.K.
2003 "Q for Quartair" Group exhibition, 113 Noordeinde, The Hague, The Netherlands. 2001 "Hotels" group show, organized by ALUMNI ABK Maastricht, Maastricht. 2000 Korero Korero Telling Stories, Exhibition with Sarah Buist Sargeant Gallery | Te Whare o Rehua, W(h)anganui, New Zealand. 1999 "Diversity" group show, Galleria Halvare, Oulu, Finland. An Edition of 19 ( including all variations ). In private collections in The Netherlands and the Collection of Sarjeant Gallery/Te Whare o Rehua Whanganui, New Zealand. Virtue of the Rose, 1992 -3.